Okay you have a camshaft and you want to install it into your engine. We will do a separate guide to the actual fitment at a later stage. This guide is for the actual dialing in of the camshafts. Very important as the wrong setting up of a camshaft severely affects the idling and drive-ability of the vehicle. There are many ways of doing this and many people want to know the lift / duration and cam opening / closing times etc. This is all too hard way of doing it. RPW instead uses the following methods called the "Centre Line Method" by working off the centre-line of the camshafts. Is a lot easier and we have been doing this successfully for a number of years. We hope this makes life a little easier for you to do as well. We will try to be as specific as we can with detailed photos. RPW takes no responsibility for this guide and is not liable for any wrong fittings, accidents and anything relating to this information. Any reference to this information is done at the users own risk. 2. Remove rocker cover and all items across the top of the motor. If you are having difficulty with any of this stop now, refit everything up and take the vehicle to someone who knows what they are doing. It is a lot cheaper in the long run. 4. Fit your degree wheel to the crankshaft and affix a marker to where zero degrees is on your pulley. This may neccesitate removal of your front pulley off your engine. Ensure you get the car on TDC number 1 before removing the pulley. 2. Now turn the motor backwards half a revolution and zero your dial gauge again. 4. You will note that there is a degree of movement, usually 10 degrees of where you can continue to turn the motor without the dial gauge moving. You can either work on the halfway point of the start and finish of this movement, the start or the finishing of this movement as long as you use the same reference point on all measuring. 5. 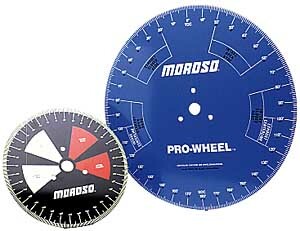 Using whatever method described above, mark the position on your degree wheel that this max lift point is. Best to write it down on a piece of paper. It will be something like 110 degrees BTDC etc. (C) Step 4 ..... - Working out the center line of your camshaft. 1. Now you have your figures, and for ease of understanding lets say that the max lift point of your exhaust lobe is 110 degrees BTDC and the intake lobe max lift point is 120 ATDC to save confusion. 110 Deg BTDC minus 120 Deg ATDC which would result in the camshaft center line being 10 Degrees ATDC. Therefore the camshaft is at this time running 10 degrees Advanced. 1. Now you need to perform the same work but on the other bank of your engine. We have found using number 4 cylinder to be the best one as the cam timing marks will be in the same positions as the number 1 cylinder. 2. Now that you have performed the check on both banks, you need to firstly balance the camshafts to both themselves as well as set them to whatever your desired position in reference to advance / retard as outlined below. 3. Remember this is a circle so whatever amount of degrees you wish to move it, divide it by half. For example we want a 10 degree movement in total here. So that means we need to reposition the max lift point of the exhaust lobe to 115 degrees BTDC as this will then relocate the intake lobe to 115 degrees ATDC. I hope you can see this. 4. Once you have set the camshaft center-line to zero degrees, you can now choose to either leave it there, advance or retard your cam timing to whatever your desired position. We recommend once you have found the zero point, mark the cam gear so that you can go back to that anytime without having to do all this work again.